Perhaps you remember the soft, fuzzy feel on greeting cards, textured wallpaper, or inside jewellery boxes? Add a rich, colourful, soft velvety finish in minutes. Enhance the decorative appeal of hundreds of items with the brilliant colours and soft finish of Suede-Tex Fibres. It's so easy to use. Step One : Coat the surface with the the clear Water Based Adhesive which is especially formulated for flocking. Your brush should glide easily through the adhesive - if it feels tacky then mist it lightly with water. Immediately apply the Flock. Step Two : Apply the Soft Flock or Suede-Tex fibres using the Mini Flocker or, for smaller areas, use a sieve or spoon. Allow your project to dry and then remove the excess fibres which can be reused by simply holding your project upside down to allow any excess Flock to fall off. Do NOT tap or shake. Air drying will make a durable finish however for a truly permanent result, heat your oven to 150 degrees (C) and then place your project in the oven for 5 minutes. The result is a suede like, soft durable finish with an even nap for a professional finish. The Suede-Tex fibres are available in a 3oz bag and will cover approximately 15 square feet whilst the Soft Flock Fibres come in 1/2oz bags and will cover approximately 2 square feet. This is a clear glue that has been specially formulated to brush on smoothly and with enough thickness to hold the fibres until dried. 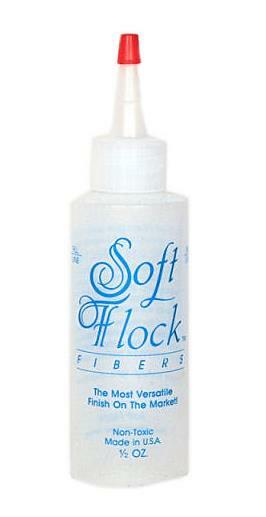 The adhesive comes in a 4oz bottle, which is enough for 4 packages of Soft Flock Fibres. Cleans up with water. The Undercoat adhesive is especially formulated to allow generous working time, hold the Suede-Tex Fibres firmly in place, and ensure durability of the final finish. 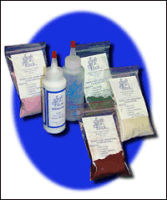 This adhesive will not crack after drying and is colour coordinated to match each shade of the Suede-Tex Fibres. The cans of adhesive are 8oz. The supply of this product is variable so please see below or contact us for availability. In place of this you can also use a slow-drying enamel paint similar to the type used on outdoor furniture. 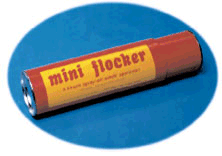 The Mini Flocker is an applicator used to separate and propel the Flock fibres into the adhesive, creating a suede like professional finish. Easy to open and load, it is just as simple to empty in preparation for the next colour. 600 series Flock - Rayon made from wood pulp, 0.75mm. Recommended for indoor use. 700 series Flock - Nylon made from petroleum, 1mm. Fade resistant and, when a waterproof adhesive is used, suitable for outdoor uses such as decoys, car dashboards and for making non-slip surfaces. In place of the coloured Undercoat Adhesive you can also use a slow-drying enamel paint similar to the type used on outdoor furniture.